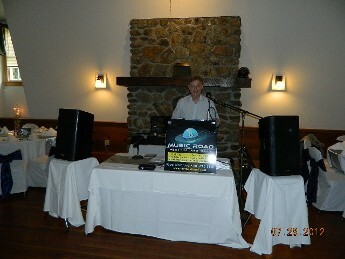 At Music Road DJ Service in in Tilton, NH, I understand you have a budget. You're looking for the best value, but you don't want to sacrifice professional service. My prices are very reasonalbe, because I don't have a large overhead. I upgrade my equipment and songs quite frequently. I am not a large DJ service. But I promise a personal touch, years of wedding DJ experience, and a great deal of fun. I also know that some people know exactly what they want for their wedding, and some who don't have any idea. That's where I can assist you. I don't tell what you need, I listen to what you would like. Based on our talks, I recommend timelines and dance music selections. No two weddings are ever alike. That's why I incorporate you and your fiance’s personality and style in the DJ service program. My motto is "Weddings Your Way." With consultation we can find the best package for your very special day. We can also discuss a timeline, and music selection for your wedding day. In selecting music don't forget your guests. Communication can be done via email, phone, and/or in person. Whatever is easier for you. I understand you have a busy lifestyle. • Wireless microphone for announcements, toasts, & etc. • Music equipment, including: Numark mixer, 2 QSC powered speakers, wired microphone, wireless microphone, laptop, with cd backup. • Group dancing such as: Cupid shuffle, YMCA, Cha,Cha, Slide, The Wobble, Line Dancing, The Twist, and Cotton Eye Joe. • Music for the cocktail hour, dinner time, and dancing time in the same room. If the cocktail hour is in a different room. I will provide a portable music player. The DJ starts when the Bridesmaid Processional begins. • Create a music play list for (1) Bridesmaid Processional music entrance, including Bridesmaids, flower girl, ring bearer, (2) Brides entrance, and (3) Recessional Song played as the married couple, and bridal party leaves the ceremony area. • Set up and breakdown time for additional music equipment Example: Gazebos, another function room, or where the music from a reception can't be heard for the Ceremony. If Ceremony is done in the same room as the reception, no additional music equipment is necessary. There will be no additional fee. • One wireless microphone for the person performing the ceremony, bride, and groom. FOR OTHER EVENTS, PLEASE CLICK ON SPECIAL EVENTS PAGE FOR MORE INFORMATION AND PRICES.